DEAUVILLE, France – Russia abandoned one-time ally Moammar Gadhafi and offered Friday to mediate a deal for the Libyan leader to leave the country he has ruled for more than 40 years. The striking proposal by a leading critic of the NATO bombing campaign reflects growing international frustration with the Libyan crisis and a desire by the Kremlin for influence in the rapidly changing Arab landscape. With Gadhafi increasingly isolated and NATO jets intensifying their attacks, Russia may also be eyeing Libya's oil and gas and preparing for the prospect that the lucrative Libyan market will fall into full rebel control. Early on Saturday, two NATO air strikes shook the Libyan capital, Tripoli. It was not immediately clear what was targeted. "He should leave," Russian President Dmitry Medvedev said of Gadhafi. "I proposed our mediation services to my partners. Everyone thinks that would be useful." The proposal thrust Medvedev into the spotlight at a summit in France of Group of Eight rich nations. Talk of this year's Arab world uprisings has dominated the summit. Analysts question whether Russia still has any leverage over Gadhafi, and the leaders of France, Britain and Germany said there's no point in negotiating directly with the Libyan leader himself. "If Gadhafi makes this decision, which will be beneficial for the country and the people of Libya, then it will be possible to discuss the form of his departure, what country may accept him and on what terms, and what he may keep and what he must lose," Medvedev told reporters. Medvedev said he is sending envoy Mikhail Margelov to the rebel stronghold of Benghazi immediately to start negotiating, and that talks with the Libyan government could take place later. Margelov said earlier Friday that it's necessary to negotiate with all "reasonable" representatives of the government, including Gadhafi's sons. In response, Libya's deputy foreign minister, Khaled Kaim, said: "Russia is one of the traditional friends of Libya. ... We don't think that Russia will sway its position to side with NATO." He would not say whether Gadhafi had been informed of Medvedev's proposal, but told reporters in Tripoli that the Libyan leader was constantly watching the news. South African President Jacob Zuma is also using his party's ties to Gadhafi to work out a peaceful outcome, heading to Libya on behalf of the African Union. In Washington, U.S. State Department spokesman Mark Toner called Russian, South African and U.N. mediation efforts with Gadhafi "constructive," but said they needed to make clear that the Libyan leader must leave power. "I don't know if it's up to the international community, given what Gadhafi has done against his own people, to prepare him any kind of easy exit or some kind of golden parachute to leave Libya," Toner told reporters. Asked what value the mediation might then hold, Toner said the efforts could be useful "to make him or his regime see clearly the writing on the wall." "There's no way out," Toner added. "He's no longer the legitimate leader in the eyes of the international community, in the eyes of his own people. The sooner he accepts that and moves on, the better." It's unclear what exactly Gadhafi — known as the Leader of the Revolution or Brother Leader in Libya — could step down from. He has no constitutional executive position, but wields power by force of his personality and presence, making it difficult to guarantee that he has given up power as long as he and his sons remain in the country. 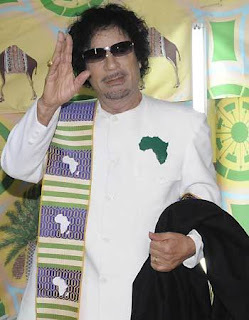 The opposition wants Gadhafi exiled. Medvedev said he wouldn't offer Gadhafi refuge in Russia but said with a grin, "such countries could be found" that would be willing to take him in. Russian officials have been critical of Gadhafi but also say NATO is using excessive force. Russia recently held talks with representatives of both Gadhafi's government and the rebels. Russia often straddles the divide between the Western nations with which it shares a table in the G-8, and the Arab nations that Moscow nurtured during the Soviet era. Moscow offered to negotiate with Saddam Hussein in Iraq in the 1990s, and is a member of the so-called Quartet negotiating for Mideast peace, alongside the United States, European Union and United Nations. Over the past decade, the Kremlin sought to revive its influence in the Middle East and saw Gadhafi as one of its partners in the region. Libya struck multibillion dollar deals to procure Russian-made weapons, and Russia's gas monopoly Gazprom has big investments in Libya that have been threatened by Gadhafi's attacks on rebel forces. Medvedev discussed the mediation offer with President Barack Obama at talks on the sidelines of the G-8. "The Russians of course have long-standing relationships in Libya that frankly we don't have," U.S. deputy national security adviser Ben Rhodes said Friday. "We are going to be in close touch with the Russians as they pursue their conversations with the Libyans." A Libyan rebel spokesman, Abdel-Hafidh Ghoga, said Russia's offer should have come sooner. "It's too late, and it's not a big deal," Ghoga, the vice chairman of the opposition National Transitional Council, told a rally in the eastern city of Benghazi. But the timing may be propitious. Libya's rebels have consolidated their position, and NATO pounded Tripoli with its heaviest strikes yet this week. Fuel and food shortages in the capital are starting to take a toll. "The world does not see (Gadhafi) as the Libyan leader, and this is the position of not only the G-8 but also of all the African states that attended today's summit," Medvedev said. A Moscow-based Middle East expert expressed doubt that Gadhafi will agree to step down after Benghazi-based opposition leaders rejected a cease-fire agreement proposed by the African Union in late March. Gadhafi "will fight to the end with unpredictable consequences for everyone involved," Yevgeny Satanovsky, head of the Moscow-based Middle East Institute, told The Associated Press. On Friday, rebel fighters clashed with government forces to the south and west of the insurgent-held city of Misrata. Dr. Mustafa Omar of Hikma hospital said five rebels were killed and 26 wounded. It was unclear if any government soldiers were killed. While rebel fighters have pushed Gadhafi's troops to Misrata's outskirts, the city, Libya's third largest, has been under siege for months, receiving food and medical supplies only by sea. French President Nicolas Sarkozy, hosting the G-8 summit, said Friday there is "great unanimity" about an "intensification of the military intervention" to protect civilians. He did not say how, but France and Britain said this week they are ready to deploy attack helicopters in the campaign. British Prime Minister David Cameron told reporters in Deauville that the deployment of helicopters was "part of the process of turning up the pressure" on Gadhafi. He said the campaign is entering a "new phase." So far, the NATO campaign has relied largely on strike jets dropping munitions from an altitude of about 15,000 feet (4,600 meters). The helicopters, flying much lower and slower, could more accurately identify targets in densely populated areas while risking fewer civilian lives. But such flights would also expose the helicopter crews to greater risks. Michelle Faul in Benghazi, Ryan Lucas in Misrata, Vladimir Isachenkov and Mansur Mirovalev in Moscow, Don Melvin in Brussels, and Jamey Keaten and Julie Pace in Deauville, and Bradley Klapper in Washington contributed to this report.